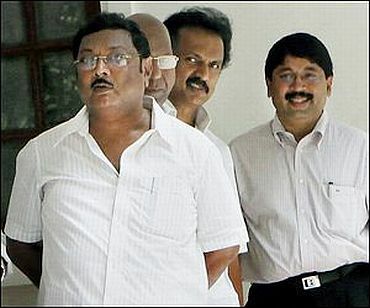 Despite a threat to the very survival of the United Progressive Alliance government in terms of numbers, the Central Bureau of Investigation on Wednesday reached the inner recesses of the family of Dravida Munnetra Kazhagam chief M Karunanidhi, targeting both his wife and daughter along with DMK workers, sympathisers as well as journalists close to the party in raids, which began in the morning and continued through the day. Besides, corporate lobbyist Niira Radia and Telecom Regulatory Authority of India chairman Pradip Baijal were also raided in connection with the 2G Spectrum scam. The raids lead to speculation that some Delhi-based journalists, who were known to be close to Radia, may also be raided. Investigative agencies have found that they are also in possession of a great deal of unaccounted for money, which would need to be explained if they are indeed targetted. A source said that if the Karunanidhi family can be targeted, then there is no reason why the others should be spared since the Congress is now fighting with its back to the wall and is trying to send a message that uncaring of whether their government falls or survives, they are on a cleansing binge and would not spare anyone who has been involved in the 2G scam. Congress spokesman Janardan Dwivedi said, "The Congress is committed to taking action against corruption and this has been stated by the congress president earlier." He added, "An enquiry is on. Let that be over. This is an answer to all those who were raising the question on the issue of corruption." On the DMK, he said that the Congress trusts its allies and that trust is always mutual. Another senior leader said the fact that Karunanidhi had not reacted on the raids, so many hours after they were conducted, clearly signals that there is no problem. He said that the Supreme Court is monitoring the investigation and is directing the CBI. Hence, the government has no role to play in this. He also said that the raids would have no impact and that there is no threat to the UPA government. The DMK is having a meeting on Saturday to discuss the situation arising out the raids and what steps the party needs to take and what kind of reaction to formulate. 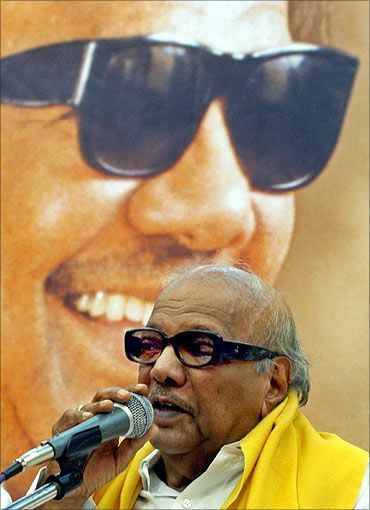 The assembly elections in Tamil Nadu are due in May 2011 and with the clock ticking away and the DMK needing the support of the Congress in the state, particularly since Jayalalithaa is waiting with open arms, would also play a role in dictating Karunanidhi's response. There are also reports to suggest that A Raja may be arrested, as some of his aides have turned approvers and are singing to whoever in the CBI wants to listen. There are problems within the DMK, as Karunanidhi's son Stalin and nephew Dayanidhi Maran are opposed to his third wife Rajatiamma and her daughter Kanimozhi, who are close to Raja and have been known to be his best protectors. Kanimozhi has already said that the raids are unfair but a more detailed response is expected from the DMK.